Our spacious cabanas have been designed to achieve a living space which subtly merges the internal and external environments. Six of the rooms are individual cottage style cabanas (sleeping up to four persons) with a full en-suite bathroom and shower providing hot and cold water. 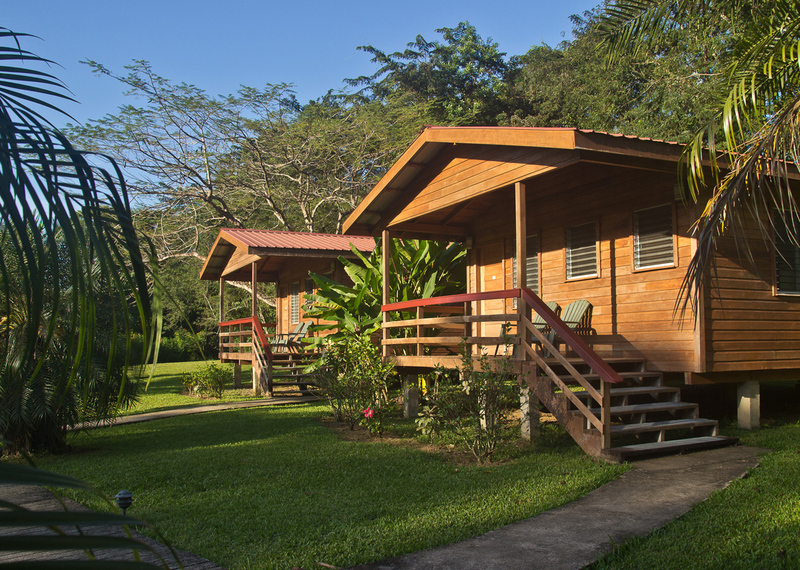 These cabanas are thatched with bay-leaf palm, a traditional Belizean thatching material. Beautifully tiled floors, ceiling fans and fully screened, wood louvered windows offer a cool well-ventilated living area. Colourful local and regional soft furnishings complete the décor. Landscape plantings around the cabanas have been selected to attract birds and butterflies close to the guest’s living space and this wealth of flora and fauna can be enjoyed from your own thatched verandah. The Lodge will deliver your choice of juice, coffee or other drinks to your verandah each morning where you can sit and enjoy the cool air or survey the early bird activity. The Lodge now has nine units with the addition of three new elegant hardwood cabanas. Each cabana has a hardwood floor and ceiling made from a mix of secondary tropical hardwoods including nargusta, santa maria and milady. Each has two queen size beds, ceiling fans, air conditioning, en-suite bathroom and shower, kitchenette with refrigerator, microwave and table-top stove with two burners.